In 1981 the film received 8 Academy Award (Oscars) nominations and winning two - Best Actor in a Leading Role (Robert De Niro) and Best Film Editing. Raging Bull also won a Golden Globe in 1982 and a BAFTA Film Award in 1982. 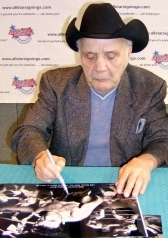 The film depicted LaMotta as very violent and paranoid, especially one scene that showed him beating his manager after accusing him of having an affair with his wife (Vicky played by Cathy Moriarty). After seeing the film, LaMotta said that it had finally made him realize what a horrible person he had been during his younger years. After he retired from boxing, LaMotta opened a nightclub on Miami Beach, Florida, and tried his hand as an actor and comedian. Life turned very sour in 1957 when he was imprisoned for six months for acting as a pimp to a 14-year-old, but claimed that he did not know the girl in question, and had been 'set-up'. 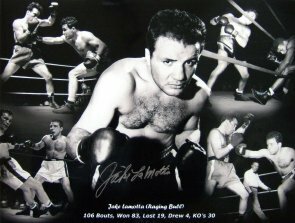 Jake LaMotta was born Giacobbe La Motta in 1921, in New York. His parents were Italian immigrants, and home was a rat-infested tenement building in a Bronx slum. His father introduced him to boxing at a young age by making him fight other children in the neighbourhood, for the entertainment of adults. The coins that spectators threw into the ring after Jake fought, helped to pay the rent at home. He acquired a reputation as a violent, small-time hoodlum and was sent to reform school for a while, after a burglary conviction. In 1941, aged 19, he became a professional boxer. 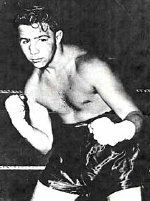 He won his first fifteen professional fights before losing twice against Jimmy Reeves. 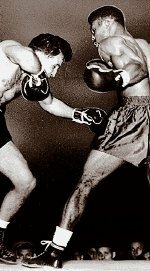 In 1942, LaMotta fought the legendary Sugar Ray Robinson, losing on points after 10 rounds. The following year, they fought two more contests, with Jake winning the first of these, and becoming the first person to beat Robinson who, until then, had won his first 40 fights. LaMotta fought Robinson (widely recognized the greatest fighter in the history of boxing) six times in all but just the one occasion. Then I had my picture taken with him shaking his hand - the very same one that hit many boxers in the ring including the great Sugar Ray Robinson! 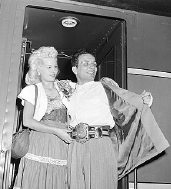 LaMotta has been married six times but most have been stormy. On one occasion, he punched his first wife so hard that he thought he had killed her. 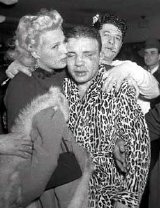 Each of LaMotta's other wives also saw the brutal side of him. Jake LaMotta's brother Joey was, for a while, his manager. 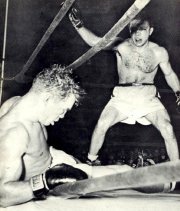 Joey was also a professional boxer in the mid-1940s, winning 32 of his 39 bouts. 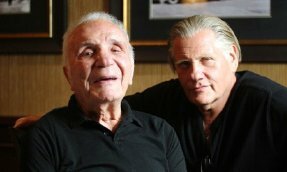 Joey was played by Joe Pesci in the film Raging Bull. 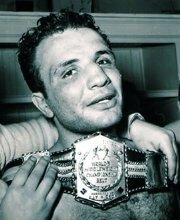 Jake LaMotta was inducted into the World Boxing Hall of Fame in 1986, and the International Boxing Hall of Fame in 1990.
his title to Sugar Ray Robinson in 1951, and retired from boxing, in 1954 - his career record includes an impressive 83 wins, with 19 losses and 4 draws. 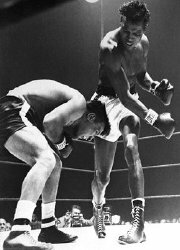 Throughout his 106 fights he was only knocked to the floor once, by Danny Nardico in 1952. 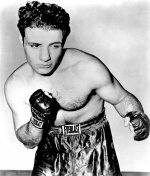 As a boxer, Jake LaMotta had a crouching style and a hefty punch, but his real strength was his great ability to absorb very heavy punches from his opponents, with little problem. He did this by paying them $20,000, and 'throwing' his fight with Billy Fox in 1947, so that organised crime elements in boxing could make money betting on the fight's outcome. The FBI were called in to investigate, and LaMotta was suspended. 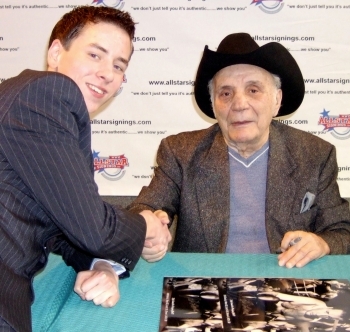 I met the legendary 'Raging Bull', Jake LaMotta, at the NEC in Birmingham in March 2007, and he signed two photos for me. 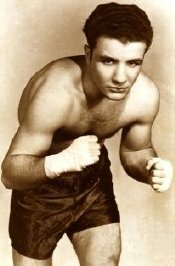 LaMotta himself has appeared as an actor in several films, notably as the bartender in The Hustler (1961) with Paul Newman, Rocco in Confessions of a Psycho Cat (1968), a detective in Maniac Cop (1988) and Don Ricci in Mob War (1989). There are those who see LaMotta differently. "He is one of the most fascinating personalities that the fight game has ever produced," says boxing historian Mike Silver. "It's easy to say that he's a wife-beater and a bum; but he's also a true entertainer who likes attention. Jake would have loved to have been an actor, he's a performer in every sense of the word." LeRoy Neiman, a distinguished sports artist with a passion for boxing, is equally fascinated by LaMotta. "He was always a colourful, conspicuous, tough, noisy roughneck. But he's a genuine guy with his own way of speaking and doing everything." 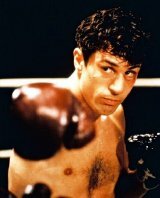 film starred Robert De Niro as LaMotta, with the actor needing to put on 4 stones in weight to play the boxer in later life. Bisbee, Arizona, on 4th January 2013. It will be LaMotta's seventh wedding, and they are to have a huge party two days after. This will double as the premiere for the feature film The Bronx Bull starring William Forsythe as LaMotta. This is not a sequel, or affiliated in any way, to Raging Bull, when LaMotta was played by Robert De Niro. memorabilia who knows him well, says, "Jake is not a friendly guy. Perhaps to a pretty woman he would be. But the truth is, he's a miserable f**k."
was a guest at the Memorabilia event held in Birmingham in March 2009. 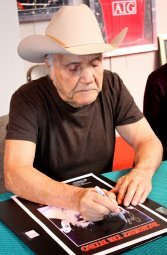 He signed my Raging Bull masterprint for me. 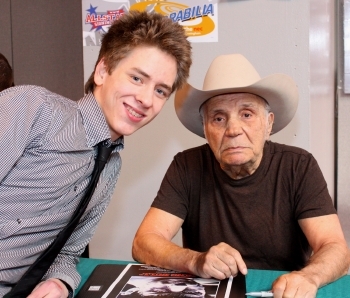 Jake LaMotta died on 19th September 2017, aged 95.